Joseph Mohr was born in the lovely city of Salzburg, Austria, in 1792. As a boy he was an active chorister in the Cathedral of Salzburg. In 1815 Mohr was ordained to the priesthood of the Roman Catholic Church. Following his ordination, he served various parishes in the Salzburg area. It was while sewing as an assistant priest in 1818, at the newly erected Church of St. Nicholas in Obernorf in the region of Tyrol, high in the beautiful Alps, that Mohr wrote the text for this favorite of all Christmas carols. Father Mohr and Franz Gruber, the village schoolmaster and church organist, had often talked about the fact that the perfect Christmas hymn had never been written. With this goal in mind, and after he had received word that his own church organ would not function, Father Mohr decided that he must write his own Christmas hymn, immediately, in order to have music for the special Christmas Eve Mass and to avoid disappointing his faithful congregation. Upon completing the text, he took his words to Franz Gruber, who exclaimed when he saw them, "Friend Mohr, you have found it-the right song—God be praised!" Soon Gruber completed his task of writing the right tune for the new text. His simple but beautiful music blended perfectly with the spirit of Father Mohr's words. The hymn was completed in time for the Christmas Eve Mass. and Father Mohr and Franz Gruber sang their hymn to the accompaniment of Gruber's guitar. The hymn made a deep impact upon the parishioners, even as it has on succeeding generations. The passing of time seems only to add to its appeal. Neither Mohr nor Gruber intended that their hymn would be used outside of their little mountain village area. However, it is reported that within a few days after the Christmas Eve Mass, the organ repairman, Karl Maurachen of Zillerthal, a well-known organ builder of that area, came to the church and obtained a copy of the new hymn. Through his influence the carol spread throughout the entire Tyrol region, where it became popular as a Tyrolean Folk Song. Soon various performing groups such as the well-known Strasser Children’s Quartet began using the hymn in concert throughout Austria and Germany. 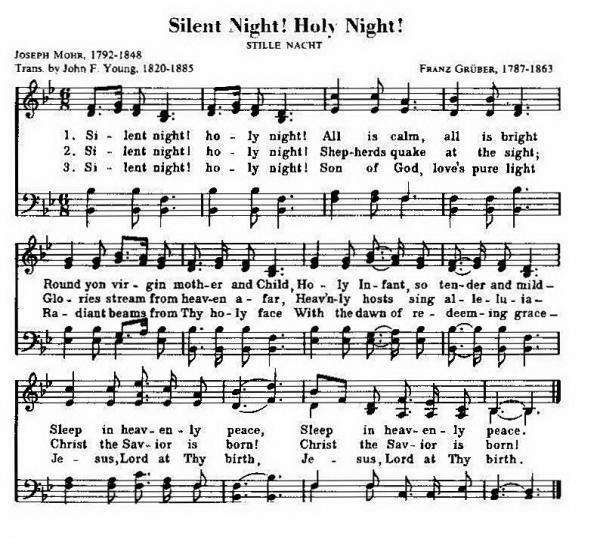 In 1838 it first appeared in a German hymnal, where it was titled a "hymn of unknown origin." It was first heard in the United States in 1839 when a family of Tyrolean Singers, the Rainers, used the music during their concert tour. Soon it was translated into English as well as into other languages. At least eight different English translations are known today. The carol is presently sung in all of the major languages of the world and is a universal favorite wherever songs of the Christmas message are sung. The translation by John F. Young is the version most widely used in this country. Young was born at Pittston, Kennebec County, Maryland, on October 30, 1820. He was ordained to the Episcopal Church and served a number of years as a bishop in the State of Florida. Throughout his church ministry he had a keen interest in sacred music. This translation of Mohr’s German text first appeared in 1863 in Clark Hollister’s Service and Tune Book. In addition to this translation of this text, Young is also known as the editor of two published hymnals, Hymns and Music for the Young, 1861, and Great Hymns of the Church, published posthumously by John Henry Hopkins, 1887.